Home / In the Media / We are PAC+CARE. Australian federal and territory legislation requires fire and emergency services to safeguard the health and safety of their employees at work. In a continuing commitment to protecting responder health and well being while ensuring longevity of PPE/C, Pac Fire is proud to introduce PAC+CARE. PAC+CARE is a flexible managed service which utilises the latest in laundering technology and includes a state of the art filtration system. Thus ensuring potentially damaging contaminants removed from clothing and equipment whilst protecting the environment. EFFECTIVE CLEANING During fires, PPE/C can become contaminated with a wide range of chemical, biological and particulate contaminants that are hazardous. If not removed properly, these contaminants could significantly affect personal protection and the PPE/C’s longevity but more importantly, have adverse effects on firefighter health. 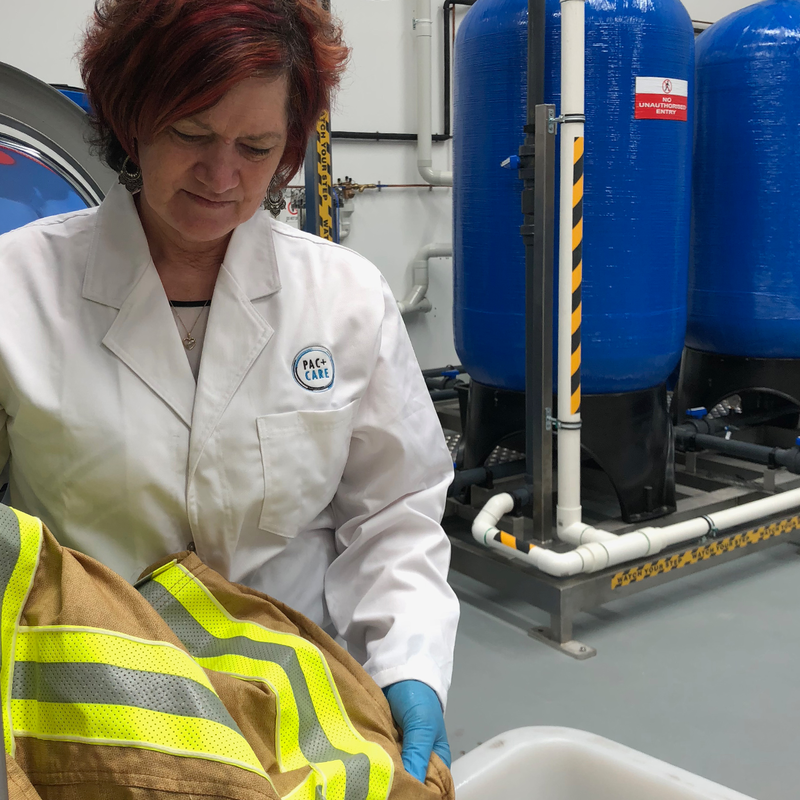 At PAC+CARE we target the most prevalent and persistent contaminants in firefighter protective wear, combat these with best practice methodology, state of the art washing and drying technology while utilising the latest chemical inactivation. This yields a significant reduction in contaminant load, mitigating the effects of exposure to firefighters and ensures Service’s PPE/C has a prolonged operational life. VALIDATING OUR CLEANING PAC+CARE commissions NATA accredited laboratories to assess the efficiency of their laundering process. This is achieved by sampling test fabric soiled with predetermined contaminants under laboratory conditions and benchmarking these results against a clearly defined performance criteria. Services can be assured that PAC+CARE’s cleaning process is independently verified and certified as being of the highest quality and is continuously being confirmed by internationally recognised organisations. LAUNDRY FILTRATION SYSTEM PAC+CARE’s filtration system is designed to ensure that contaminants removed from clothing and equipment do not end up in precious water ways. PAC+CARE’s state of the art filtration system treats water to industry-best standard by removing contaminants associated with firefighting while safeguards are in place to mitigate the risk of any environmental impact caused by spill or discharge of effluent. This is all backed by PAC+CARE’s comprehensive testing regime which ensures the filtration systems effectiveness. BEST PRACTICE INSPECTION Early identification of damage to protective clothing and equipment is essential to preventing degradation and identifying early warning signs that the item is unfit for purpose. Stay up to date with all the news at Pac Fire? Head over to our Facebook page and hit the “Like” button for our news to show up in your daily feed. Facebook not your thing? Follow us on Linked In. My volunteer role is mainly with forest fires and as I have proban treated PPC how does your washing process affect the proban and how many of your washes rend it ineffective? Typically and if subject to the PAC+CARE cleaning program, we should be able to get at least 25 cycles out of a reputable product before treatment begins to weaken. That said, there are a range of other variables which may impact on the material’s protective qualities and consequently, impede on this number.